Evan Gattis is having one heck of start to his MLB career, and is the talk of Atlanta - if not every other NL City. He hit is first home run off Roy Halladay in only his second career at bat, through May 21st he's hit 9 Home Runs and was named NL Rookie of the Month for April. This kid is a big part of the Braves hot start to the 2013 season. We have 12 official bats signed by Evan Gattis - YOU WON'T FIND ANYTHING LIKE THIS ANYWHERE ELSE! 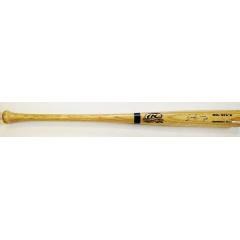 We have 6 blonde bats and 6 black bats - all signed by Braves rookie sensation Evan Gattis. Due to the rare nature of this offer we must charge your credit card for the full price immediately upon taking your order. This policy ensures we reserve a bat for you. We will confirm your order by Email. This ball is not game used. Please allow at least 3 to 4 weeks for delivery - authentication is in process.